Another Roger Corman Cult Classic is on the way to Blu-ray this July. 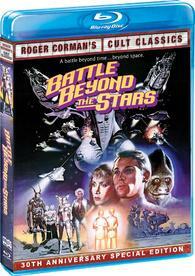 In an early announcement to retailers, Shout Factory says 'Battle Beyond the Stars' starring George Peppard, Robert Vaughn, and Richard Thomas and is planned for Blu-ray on July 12. The 1980 sci-fi flick was nominated for four Saturn Awards including Best Costumes, Best Make-Up, Best Special Effects, and Best Science Fiction Film.